Now that I'm on break from college, I've been working on a post I'd been planning to write for a while. Yesterday morning, though, I received an email from crossword historian and litzer Todd Gross, who sent an amazing end-of-year olio on three pre-Shortzian constructors: Alexis P. Boodberg, who published at least four puzzles in The New York Times during the pre-Shortz era; Patterson Pepple, who published at least 37; and Charles B. Waffell, who published at least three (and one in the Shortz era). I've decided to publish Todd's findings first as a grand finale to the year and then follow them with another post in a week or so. Enjoy—and thanks so much, Todd! I knew nothing about this constructor before I started searching recently. First, I tried entering this name in Google and it suggested Peter Boodberg as an autocomplete, which led to this Wikipedia page. So Peter Alexis Boodberg taught in the Oriental Languages department at the University of California, Berkeley, from 1932 until his death in 1972, first as an instructor and then later as a full professor (and department chair). He was born in Vladivostok in 1903 to an aristocratic family from Estonia. Estonia was annexed by Russia in the 18th century, the family became soldiers in the Russian army, and Peter’s father was sent to Vladivostok as commander of the Russian forces there. When World War I started, Peter was attending a military school in St. Petersburg; his father sent him to Harbin in China, and later he returned to Vladivostok and studied at the Oriental Institute there. By 1921, with the Bolsheviks being in control of Russia and the family being aristocrats in imperialist (czarist) Russia, they emigrated to San Francisco (with Peter actually arriving in 1920). I have a fair amount of information on Dr. Boodberg; alas, none of it mentions crosswords. Still, this might at first seem to be our constructor: Not only do the names match (and Boodberg is a rather uncommon surname), but our professor clearly had the sort of mind that could have created such puzzles. Besides his clear intelligence and facility with language(s), he apparently composed verse in English and Russian. Also, VLADIVOSTOK appears in Boodberg’s second New York Times puzzle, "WITH CLUES FROM THE NEWS." 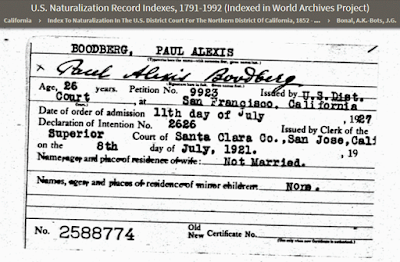 Alas, I can’t be 100% sure this is the right person, because there is a Paul Alexis Boodberg (almost certainly Peter’s brother) who was born in Vladivostok and emigrated to San Francisco. Paul was born in 1900 and became an Electrical Engineer. 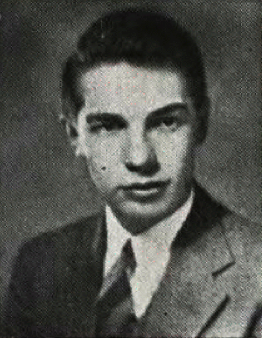 I’m also finding an Alexander Boodberg, who taught Mechanical Engineering at UC Berkeley, was born in 1906, and passed away in 1952. 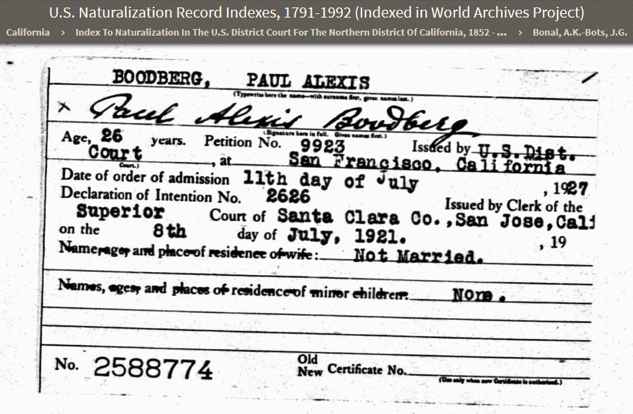 And finally there’s also Alexis Paul Boodberg who was born in 1869 and passed away in 1945 in San Francisco. This matches the Wikipedia article’s dates for Peter’s father, Baron Alexis von Budberg, so I’m confident that’s who this is. Well, this name fits the New York Times constructor name better than Peter Alexis Boodberg. And Boodberg’s final puzzle was published in 1944, just before Alexis’s death. Also, a lengthy obituary for Dr. Peter Boodberg in the Journal of the American Oriental Society (thanks, David, for getting a copy for me!) 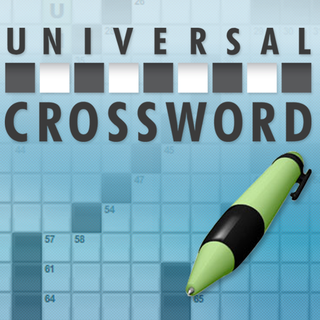 makes no mention of crosswords. So he was already using Alexis P. Boodberg as his name in 1922 and already writing English at a pretty proficient level (though of course, I don’t know how much of that is the editor vs. the author). And Boodberg’s first puzzle (titled "WITH CLUES FROM THE WAR MAPS") is right up the Baron’s alley, with references to Russia and the Asian Pacific. His second puzzle, another Sunday ("WITH CLUES FROM THE NEWS"), is even more telling. 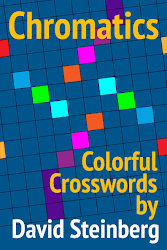 Its 1-Across entry is REVAL, clued as [German name for capital of Estonia]. Peter was born in Russia and lived for a while in China before the family emigrated from Russia to the United States. It’s certainly possible that Peter would know REVAL, given that his family was originally from Mainz and lived for centuries in Estonia. But even if he did, he’d been an educator in the United States for long enough by 1942 to know that most solvers would never have heard of this. It seems far more likely that someone like Baron von Budberg would not just know REVAL but feel comfortable placing it at 1-Across. So at this point I’m betting that Baron Alexis Paul Boodberg is our constructor. In a 2012 post, David wrote that he thought Patterson Pepple might be an alias for pre-Shortzian editor Eugene T. Maleska; in a later post, he had come to believe that Pepple was a real person. 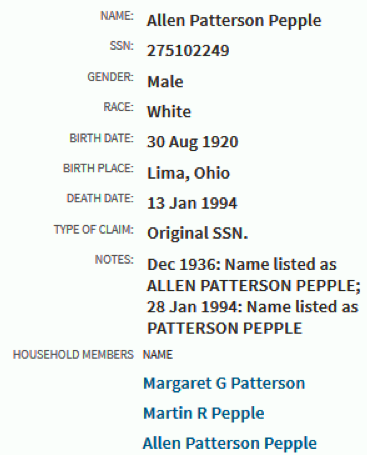 I can confirm there is a real Patterson Pepple and can even show you a picture of him. 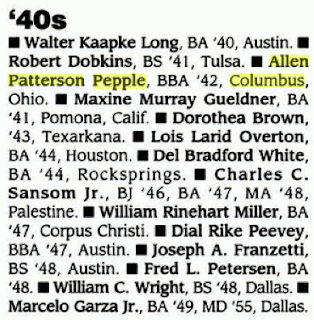 He began life as Allen Patterson Pepple in 1920 but at some point dropped the Allen. Here's another example of someone who legally changed his name. 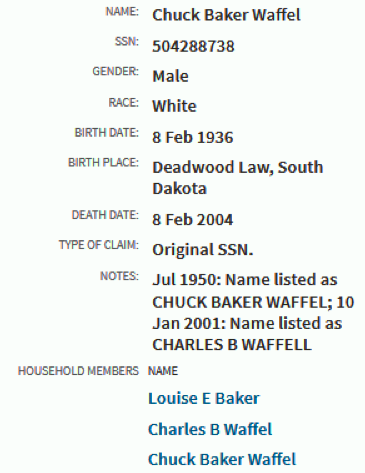 Mr. Waffell started out life as Chuck Baker Waffel in Deadwood, South Dakota (yes, that’s where Wild Bill Hickok was shot and killed while holding the famous dead man’s hand). Photo courtesy of Cañon City High School, Colo.
Again, I don’t have an obituary for Mr. Waffell, and I don’t have any documents that tie him to crosswords. I do, however, have a record that showed him living in La Jolla, California, in 1994, the year his final New York Times puzzle was published (which is weird, because about six years later I lived in an apartment in La Jolla that was a short walk away from him!). I’m pretty sure he was in Florida by then. But the three pre-Shortzian puzzles were probably constructed while he was living in Denver—he lived a lot of different places, didn’t he?—which means, thanks once again to the fine folks at Simon & Schuster, we can tie our Deadwood-born man to the dead wood paper crosswords he constructed. 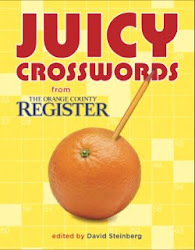 In this case, Simon & Schuster’s Super Crossword Book 9: The Biggest and the Best (1996). Actually, we can do better than that. 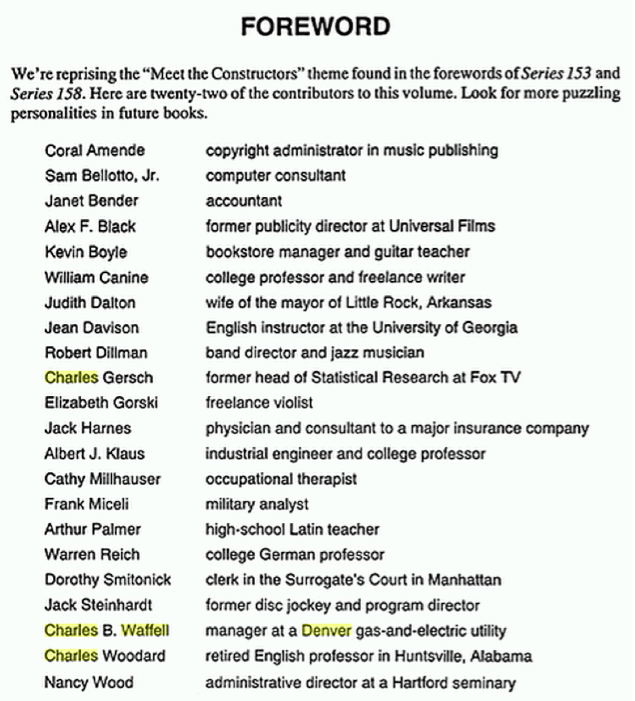 While doing this research, I found out that Simon & Schuster sometimes published special forewords to their crossword volumes. 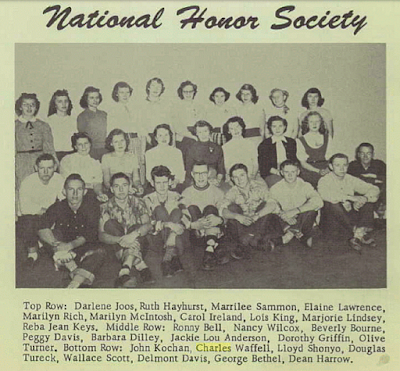 One of them says Mr. Waffell was a manager for a Denver gas-and-electric utility. 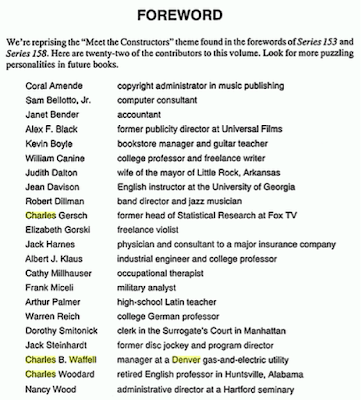 Note that it also mentions other constructors I’ve written about before. I don’t know if I’ll be publishing any more reports on pre-Shortzian constructors . . . but if I do, these forewords might very well help me find some of them. Thanks so much again, Todd, for all this great research! It's always a fascinating journey into the past and really helps bring long-gone pre-Shortzian constructors back to life. 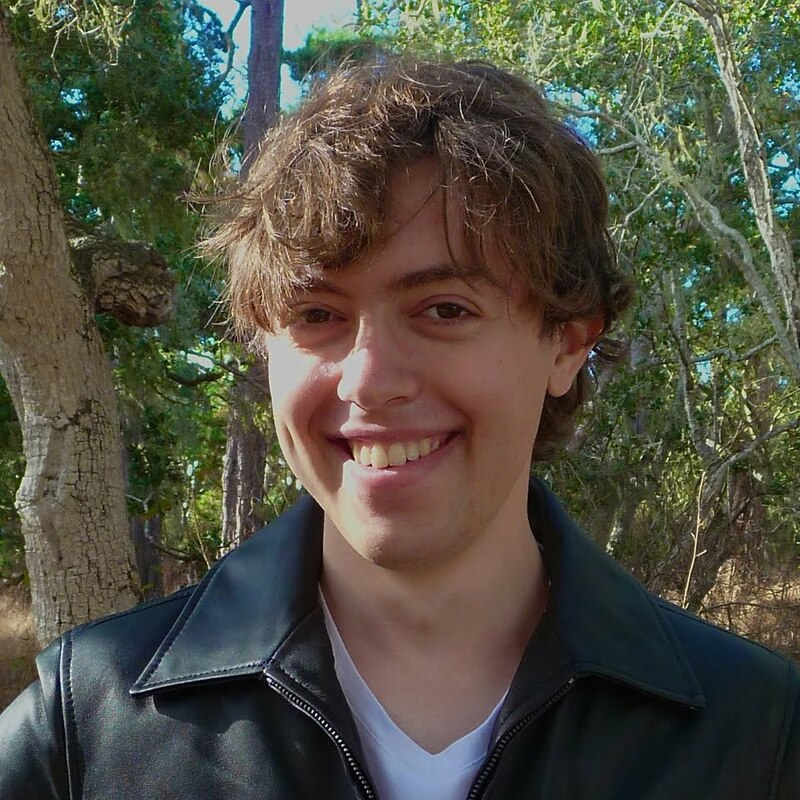 I thought Todd's Alexis P. Boodberg findings were especially intriguing because of the difficulty in deciding whether Peter Alexis Boodberg or his likely father, Baron Alexis Paul Boodberg, was the constructor of those four New York Times crosswords. I agree with Todd that it was probably the latter. 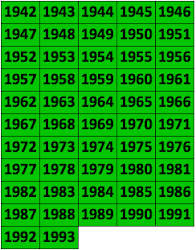 Not only did Alexis Paul die a year and a half after the last known Boodberg puzzle appeared in the Times, but if his son Peter Alexis had been the constructor, Peter would have lived for 28 more years after that final puzzle's publication, and it seems odd that he wouldn't have published any more puzzles during that time. I also question whether Peter Alexis would have used his father's name instead of his own as his byline, though it's possible he might have if he wanted to keep his cruciverbal publications separate from his academic ones. Another piece of evidence that Peter Alexis was indeed Alexis Paul's son is his (Anglicized) middle name, or Russian patronymic. The patronymic also supports the supposition that Paul Alexis was another son of Alexis Paul and the brother of Peter Alexis. If anyone has further information corroborating that Baron Alexis Paul Boodberg was the constructor, please comment below or write to me directly.